Reading is the number one key to getting an excellent education. 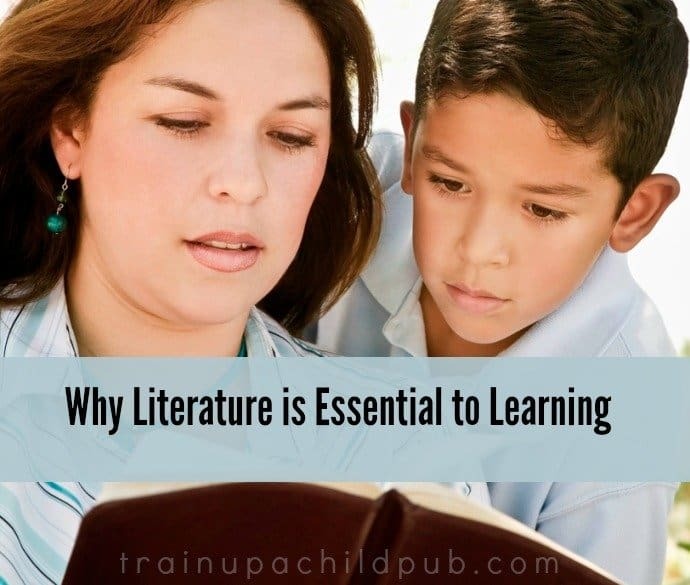 Read more to find out why literature is essential to learning and how to easily incorporate it into your homeschool day. Do you remember falling in love with Old Yeller ? Remember how he saved little Arliss from the bear and his mother from the wolf? Did you cry at Travis’ bravery and sacrifice when he had to shoot his beloved dog after it contracted rabies? Did you rejoice with Hansel and Gretel in Hans Brinker or the Silver Skates, cheering when Gretel won her race and their dad regained his memory after the accident? You remember your favorite childhood books, no matter how long it’s been since you’ve been a child. That’s because a great story sticks with you! So it’s not rocket science to realize that one of the easiest things you could do today to make your homeschooling MORE ENGAGING AND EFFECTIVE is have your children read more high quality literature. Not only will great books make your homeschooling more successful, research consistently shows that literature is essential to learning. Why is Literature Essential to Learning? Literature is essential to education, no matter what type of philosophy or homeschool ‘method’ you use. It’s foundational to learning because essential skills such as reading, understanding, critical thinking, discussion, narration, and imagination are all used and enhanced through literature. Additional benefits include stronger vocabularies and reading comprehension as well as development of solid pre-writing skills. By the way, I’m not talking about textbooks here. Instead I’m referring to “real” books. Excellent literature. Also called “living books.” Living books are written by authors with a passion for their subjects. They are chock full of ideas and ready to capture the imaginations of their readers. A fascinating story gives pleasure to listeners and readers. It sparks imaginations and develops thinking skills. Literature provides a language model for those who hear and read it. Therefore it paves the way for better writing in future years. Literature supports all areas of your language arts curriculum. Literature can support your history, science, geography and other curriculum areas, as well! By reading about other’s problems, literature helps children deal with their own problems. It also helps kids better understand the problems of people they know and hear about. Reading about other races and cultures helps young readers value others who are different from them. Literature helps one see the world more broadly. It helps us not to be so centered on ourselves. Reading excellent literature can teach many moral lessons and develop the character of readers. Superior literature will be enjoyed by several ages at the same time, making reading aloud an activity the family can enjoy together. I don’t know of another element of education that can do all of those things, do you? So, How do I use Literature to Teach? A Week of Gentle Grammar Lessons – this is a week of language arts lessons from our 4th grade daily lesson plans. You can see how easy these literature lessons are to put together and teach! And even better, you can use the same books your students are using in history and science. Additionally, this allows your students to review history/science at the same time as they do language arts! 15 Creative Language Arts Lessons Using Living Books – this post provides many additional ideas Charlotte Mason left us about ways to use literature to teach language arts, other than oral narration. These ideas are perfect for late elementary, with a few for middle school and even high school. You’ll be surprised at the variety of ideas! Our Favorite Christmas Books – provides a list of beautifully illustrated, keepsake books. I bet some of them are new to you. Included in this post are character lessons and additional Christmas activities. As a homeschooling family you have a one-of-a-kind opportunity to incorporate more literature into your children’s lives. But I warn you — if you start reading more excellent books, you might have to give up your textbook curriculum in favor of a literature-based one. If you do, you’ll never look back! Even if you aren’t yet ready to ditch your textbooks in favor of total learning using high quality literature, make sure to add more great books into your homeschooling. You will reap mighty benefits and your kids will thank you! Following is a short list of some of our favorite books to get you started. The Phantom Tollbooth is perhaps the most original book we’ve ever read. The story’s about a very bored boy, Milo. Then Milo finds a tollbooth. And what a tollbooth! It transports him into an incredible place, full of adventures! Milo is not bored anymore! Many lessons here with hilarious word play! Perfect for a read aloud! The Green Ember will be one of your children’s favorite read-alouds of all time. A swashbuckling, heroic story of good against evil with rabbits as the main characters, it has excellent character lessons and plenty of excitement and drama, with a sprinkling of humor. Hans Brinker (or The Silver Skates), is chock full of adventure, suspense and character lessons as your children read about 15 year old Hans and his younger sister, Gretel, and their seriously injured and amnesiac Dad. Hans’ sacrifices for his dad and others throughout the story will inspire your children, as well as expose them to life in the Netherlands in the late 1800s. Great ending! The Bronze Bow is the exciting story of an eighteen year old boy at the time of Christ who burns with hatred after losing his father. As he travels down the road to revenge against the Romans occupying Israel, he comes to learn that death is not his enemy. He begins to see just how powerful the exchange of hatred for love can be. Johnny Tremain is a somewhat arrogant young man who is a highly skilled silversmith in Boston just before the American Revolution. However, one day he has a tragic accident and is unable to continue his work. Finding a new occupation leads Johnny to rub shoulders with the men of the Revolution. As the story unfolds, Johnny becomes a player in creating a new America, and learns quite a bit about humility in the process. Amos Fortune is a compelling story of a fifteen year old boy who is captured, transported to America and sold as a slave. He dreams of freedom yet maintains his courage and his integrity. After 45 years of being a slave he finally begins to see his hopes revealed. The character and humility of this great man will inspire your children This is one of our family’s favorites! So inspiring! Hittite Warrior tells the tale of Uriah, a Hittite boy living during the Old Testament Judges. He is on a mission after his family is killed by the Greeks. This book is full of history, action, war, and suspense. As you read you become immersed in the life of this young warrior as he comes to understand peace and forgiveness. Set during World War II, before America entered the war, this is the incredible story of a soldier who found his kidnapped brother who was raised as a German youth, never knowing his true identity. The struggle between their newfound brother and his real brothers and sisters is both heart-breaking and heartwarming. Will this sullen young boy, raised as a Nazi, ever be able to rediscover his true identity? Quo Vadis, which translates “Where are you going?” is set after the death of Christ, during the horrific reign of the Roman emperor Nero. Quo Vadis submerges the reader into Roman culture with its politics and intense persecution of the early church. This is a story of redemption and transformation. Parts of this book are based on the writings of Tacitus, a Roman senator (and therefore primary source) for this time period. don’t miss it! Although Safely Home is fiction, it realistically portrays the persecution of Christians in China. An American business man travels to China to visit his former Chinese college roommate who is practicing Christianity, although is terrified of being caught by the Chinese police. The reader comes to understand the heritage of the Chinese and appreciate Chinese believers’ strength and courage as they live out their faith. The author forces the reader to understand what it means to “take up your cross daily” as the story moves the American on a slow path of returning to his faith. One of our favorites! The Chosen is an incredibly moving, fictional story that will plunge you into the life of two young Jewish boys of very different sects. In spite of their differences, they forge an unbreakable bond of friendship through difficult circumstances. This book takes place in 1944. Beautifully and sensitively written, this is a story that will profoundly affect you and your students. Another book not to miss! After reading this you’ll probably want to also read its sequel, The Promise. The Chosen is in our General Literature course especially for 9th graders. To Kill a Mockingbird is a must-read for your high school students. This American classic tells the story of a courageous, honest, compassionate lawyer in the midst of a controversial court case in the 1960s. Full of suspense and drama, it will help your student understand the Civil Rights movement as well as the racial tension we still struggle with today. We’ve included this classic in our American Literature course. Don’t miss it! Okay, these last two books are classics you’ll recognize — they are fantastic in their UNABRIDGED form. I’ll warn you, they are LONG (as in 1200-1300 pages), but excellent! Plan accordingly! The Count of Monte Cristo is considered by some as one of the best books ever written — again in the unabridged version. (Make sure to check.) This is the story of a man wrongfully accused of treason and thrown into a cruel prison for many years…until he escapes and plans revenge! Quite long but well worth the time. Captivating with many character lessons. Les Miserables is another huge book, also teaching about grace and redemption. This moving book gives the extra benefit of providing tons of historical information about the French Revolution. Again, the unabridged is very long but worth it. Otherwise the best parts will be edited! Imagine a day without textbooks or workbooks! If your children are weary of worksheets, then explore literature-based learning! All of these books and more are in our literature-based homeschool curriculum. Make sure to put some of the books above on your list this year for holiday and birthday gifts for you and your kids! Do you have family favorites other than those I have mentioned? Please share in the comments! Thank you for this list of great stories!! I was recently trying to remember some good stories the other day that we could “get lost in” during a road-trip. Thanks for sharing!